The Claude C. Ries Chapter of the American First Day Cover Society is sponsoring the Grand Award for the AMERICOVER exhibit competition. The Southern California group has chosen a nine- by eight-inch crystal pyramid (like the one at left, but with appropriate engraving), which will be presented to the owner of the top exhibit at AMERICOVER, a World Series of Philately show dedicated to first day covers. 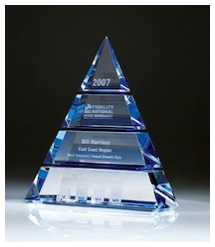 The first of these beautiful prizes will be awarded at AMERICOVER 2011 in Indianapolis, August 5-7. The prospectus for exhibitors is available here. As a WSP show, the winner of the Grand Award at AMERICOVER 2011 will be part of the Champion of Champions competition at Stampshow 2012. Ralph Nafziger, winner of the 2010 Grand with "The 3-Cent Oregon Territory Issue," will represent AMERICOVER this summer in Columbus, Ohio. In addition, if six or more competitive single-frame exhibits are entered, the Curtis B. Patterson Award recipient for the best single-frame exhibit will be invited to enter the APS Single-Frame Champion of Champions competition at AmeriStamp Expo in 2012. In addition to its Grand and Reserve Grand awards, AMERICOVER offers special awards from both the AFDCS and other philatelic societies, including ones for best exhibits of foreign FDCs, topical FDCs, pre-1931 FDCs, best exhibits by a novice and a youth, and best single-frame exhibit. The three-day World Series of Philately show will be held at the Wyndham West Indianapolis Hotel, and there is a special AMERICOVER room rate of $89. There also will be two bourses (commercial dealers and cachetmakers), a banquet, meetings, a youth table, a hospitality suite, an auction, seminars, a pre-show area tour and a post-show dinner event. A forum by a postal official involved with first day covers is also likely. The Ries Chapter is one of the most active in the AFDCS, and meets monthly. For more information, visit rieschapterafdcs.com or send e-mail to info@rieschapterafdcs.com.